Family relationships are often the most common source of stress, anguish, and illness, and even death may sometimes result from a "broken heart". Is it possible to prevent some of the difficulties, which arise in the majority of families? An old story has Moses asking God to show him Hell and Paradise. "Very well," says God, and takes him to a big room where there is a multitude of emaciated, unhappy, starving people. They are sitting around a huge table, each one holding a spoon with a very long handle. In the middle of the table, there is a pot of appetizing stew. Everyone is within reach of the food, but because of the long handles of their spoons, they are unable to feed themselves. God then leads Moses into another big room, where everything is exactly the same, with one exception. In this room, the people are very happy and content. They are joyfully feeding each other. Through having worked with many families, we have realized that the members of a family can learn how to feed each other emotionally. Although this process may take a lot of time and may demand enormous efforts from individual family members, in the final analysis, it is a possible and realistic expectation. Many of our parents brought us up with the help of two frequently used tools: guilt and shame. Both of these feelings grow out of a fear of punishment. Since almost every family looks for a scapegoat, as children we learn how to project our own faults onto someone else in order to escape this fate. If I know that I am about to be punished for stealing a cookie, I will pounce on my brother if I see a fault, however tiny, in him. Couples often live together in an atmosphere of hostility and animosity. They project onto each other their own weaknesses, faults and transgressions, which have been hidden from their conscious selves. They learn to live within a routine of conflicts and angry outbursts, raising children who learn to act in a similar manner. In some cases, children may grow to become the total opposites of their parents. 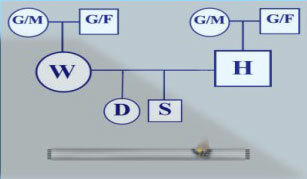 In this latter case, however, a person with a character similar to that of the parent may be recreated by skipping a generation - that is, in the grandchildren. A mould produces the opposite contour of the object being moulded, which in turn becomes a mould and creates its opposite contour, which resembles the original object. Three generations within a family may interact with each other with all kinds of variations, but they always interrelate. Let's imagine that the members of the family system communicate with each other through an electric cable, which is made up of many wires. When the relational process "heats up", the wires in the cable begin to burn. If communication begins to break down, and this breakdown directly affects one family member - let's say a son, who must remain loyal to both parents and thus is stuck between them - this member becomes a "hot wire". 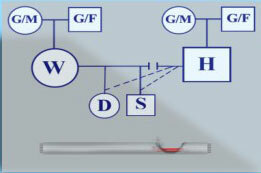 When communication between the parents has completely broken down, the children become the "hot wires". They are the only ones who conduct or carry emotions and other information between the parents. Sometimes this process occurs silently, but often the children are "pumped" for information by the adults, which is much worse for the children. 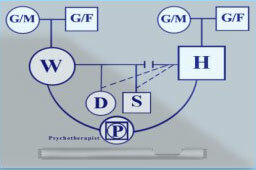 The psychotherapy process "rewires" the family. The children are freed up from having to be the "hot wires" in the family, a role that is taken over by the therapist. An experienced family therapist can often "figure out" the dynamic of a multigenerational system almost as if it were a kind of algebraic formula. The problem, though, is that this algebraic equation has very many unknowns. 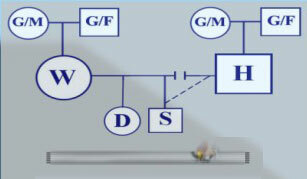 As in mathematics, the rules and specific laws of each stage of development can be observed in the family life cycle. This cycle is a very complicated process and includes the formation of the couple, the birth of each successive child, and the rearing of offspring, which are then sent out in turn to walk the difficult path of life. The more information we have about the family, the more possible it may be to anticipate just how the family process may develop. In the future, we will strive within this website to describe in detail the family life cycle with all of its features and interrelated rules and regulations. We will try to outline and to predict the possible dynamics of its development. This will permit the reader to create a kind of framework for his or her own family reality. Quarrelling families may be enlightened by making a visit to the Toronto Zoo where they can closely observe the "naked rats of the desert". These fierce creatures are constantly shoving, biting and struggling with each other for a better place within the hierarchy which will give them an advantageous place in the nest, better food, and so on. Interestingly, although they are predominantly females, the hierarchy is determined by the quantity of testosterone (the male sexual hormone) in their blood. We humans may differ from them, but only to the extent that we have a much more sophisticated system of struggle for position. In different cultures and ethnic groups, the rules of our struggle may differ markedly. Our increasing quantity of material goods and the increasing tendency of social independence from the family leads to more divorces and to more conflicts between parents and their children. Is the institution of the family in crisis? Yes, it is. But more and more psychologists, social workers and psychiatrists are beginning to understand the rules of family dynamics. 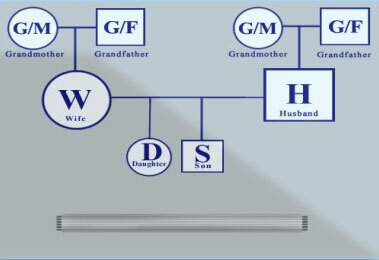 Consequently, there are increasingly more modes of treatment available which can help the family to adjust. We of the Family Life Foundation can help the family through both individual and family counselling and psychotherapy. In future discussions, we will explore stages of the family life cycle and different ways of correcting problems during the more difficult moments in the family's development. Problems often spring out of a fundamental conflict between two opposite and yet complementary family needs: on the one hand, the parents may want to create conditions for the individualization and separation of their adolescent who must eventually learn how to be independent; on the other hand, the parents may be unwilling to change or restructure the family or even gradually let go of their maturing child. At each stage of the family's development, internal crises and conflicts of this sort may occur. Another crisis in the family life cycle may be expressed by the following question: "What should we do with our aging parents?"